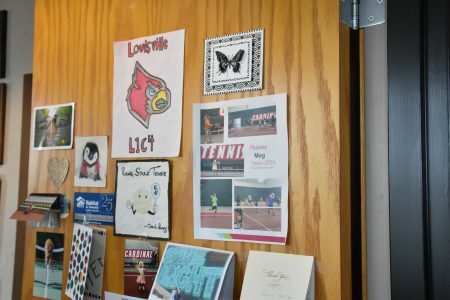 There are names synonymous with U of L athletics because of their tenure with the department. Names such as Denny Crum, Rex Ecarma, Karen Ferguson-Dayes and Sandy Pearsall all come to mind when thinking of mainstays in the program. Meg Peavy might not be a recognizable name, but it should be. Peavy’s official title is the associate director of the Bass-Rudd Tennis Center, but she wears multiple hats. Peavy first came to Louisville in 1980 to play tennis after a short junior college career at Central Florida. A phenomenal player, Peavy is all over the Louisville record book. She is first (60) and second (40) for most singles wins in a season, third with most career singles wins (100) and second with most career doubles wins (100). After her playing career ended, Peavy was approached to be the coach of the women’s tennis team. Her focus was on school so she was reluctant to take the position at first. “(Former athletic director Bud Olsen) said, ‘Just stay for a year and keep us on track.’ Somehow, 21 years went by,” Peavy said. The year was 1983 and Peavy went from your average, busy college student to a head coach of a Division I program. Peavy is the program’s all-time winningest coach, but athletics aren’t all about performance. Peavy took pride in developing her student-athletes off the court. From working in soup kitchens to doing car washes and everything in between, Peavy’s players worked as hard outside of practice as they did in it. She wanted to make sure her players remembered “all of the goofy moments” that she put them through. From different fundraising events like serving at a wedding to stopping in a snake farm on a road trip, there was never a dull moment under Peavy. There have been plenty of prideful moments for Peavy as a coach, but she said having nearly every one of her players graduate is among the top of her list. The relationships her players developed throughout the years sticks out to Peavy. “They’re so tight and such good friends. If anyone needs anything, they’re there for each other. Anytime anyone has a problem or needs help, everyone available will swarm to them,” Peavy said. The tennis teams didn’t always have the luxury of playing in the Bass-Rudd Tennis Center. Prior to its construction in 1994, the teams had to play at the courts on Third Street. “When we had the big schools, like Ohio State, come in, they would be like, ‘Are you serious? This is where we’re playing? No, really where are we playing?’ Sometimes they didn’t come back, so we had to go to them,” Peavy said. “Sometimes you don’t know what you don’t have. So I would have zip-ties in my car or twine and I would have my players help me out,” Peavy said. From the days of playing on Third Street to playing in the award-winning Bass-Rudd, Peavy has been a part of the full transition of the tennis program. In addition, Peavy has witnessed the program grow from the Metro Conference to Conference USA followed by the Big East, American Athletic and finally, the ACC. Peavy’s vantage point is shared by few. Being a teaching pro has always been a passion of Peavy’s. There’s less travel, no pressure of running a team, but still the ability to instruct tennis and watch people grow. These days, one can find Peavy somewhere at the BRTC either giving private lessons, in her office or even handling the day-to-day activities like getting the courts ready. Her daily schedule is rarely the same and often long, but Peavy said her allegiance to the university is strong because it gave her a chance at a degree. Peavy’s office is flooded with awards due to her wall-to-wall accomplishments during her lifetime. One of the awards she is most proud of is her USTA Wheelchair Tennis Award for her work with children in wheelchairs. 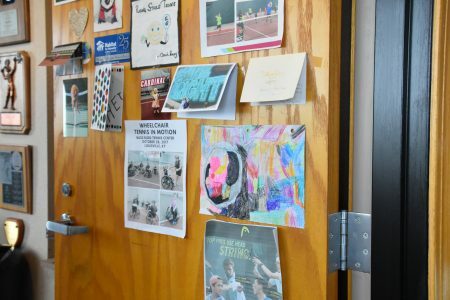 Peavy makes sure she treats every kid who comes in for a lesson a the same and said it’s a special part of her life to see what these kids go through. When asked what she wanted to be pictured with, Peavy didn’t point to her countless awards, but the art she has received from kids she works with. 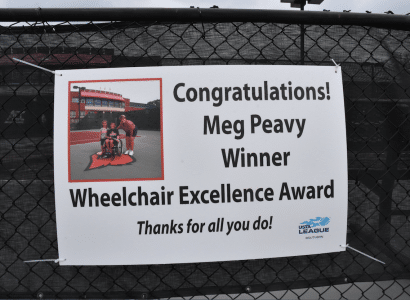 A member of the Kentucky Tennis Hall of Fame, Peavy will quietly continue her work in the community to make a difference. Always high-energy, always on the go, Peavy is a unique member of the U of L family.